Talk about contemporary art in Dubai and you will come across several brilliant artists. And, Suzi Nassif is indeed the most amazing of all with great mastery on different genres; from surrealism to abstraction and portraiture. Have you ever heard of her painting live? She’s in the ring now! A few days back, Inside Dubai in collaboration with the Wire World Adventure Parks organized an open art, public exhibition. One of the best thing happened was presence of Suzi Nassif there. With her charismatic persona and exclusively inspiring expertise, she painted a stunning piece featuring an elderly gentleman in a traditional avatar. Yes! She did live demonstration of her artistic skills for people there. ‘I Am a Pure Soul’ is one of the best paintings from her exclusive series of black and white art. The Ghotra (head fabric) and Igal (leather seal) is a dress signature of Middle Eastern culture. Undoubtedly, it’s one of the most distinct and historical elements of conventional Arab male outfits. 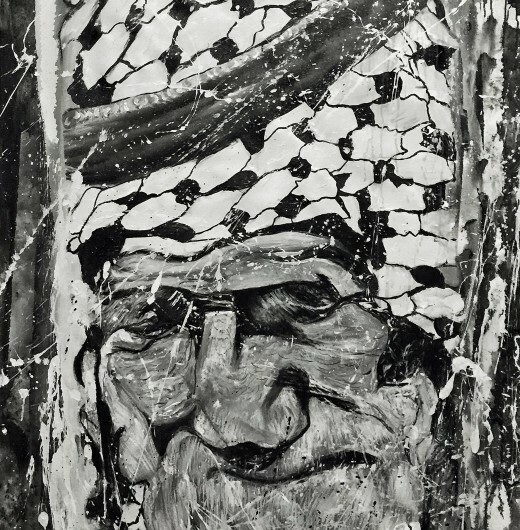 This beautifully detailed portrait of old-man wearing Ghotra & Igal is symbolic to the mutually developed and acknowledged identity of the Arab World. This masterpiece reminds us all of the shared heritage and culture that Arabs are enjoying throughout the ages. Finger’s crossed for more real and live work of this award-winning, world famous artist.